Could caffeine use during test prep increase your SAT or ACT Test score? Probably yes, at least according to new research from Johns Hopkins University in Baltimore, Maryland. According to Dr. Michael Yassa, an assistant professor of psychological and brain sciences, caffeine can give the brain a memory boosting jolt. As part of a Johns Hopkins University study, Dr. Yassa and his colleagues showed almost 200 different images to people. The test participants would then be given either a placebo or200mg dose of caffeine, then the researchers showed the images to the test patients again, sometimes a day later. “What we found was that the group that was on caffeine as compared to the placebo had better memory for the information they learned 24 hours before,” Dr. Yassa told CBS Radio’s Charles Osgood. 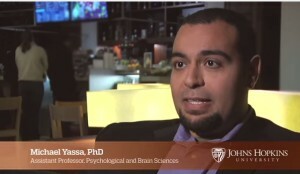 Dr. Yassa and his team had the research published in January 2014 in the medical journal Nature Neuroscience. So what is the best dose of caffeine to take if you want to increase your SAT Score? Let’s take a look at the conclusions that Dr. Yassa made. The Johns Hopkins study used participants that were not regular coffee drinkers. The study suggests that the optimal amount of caffeine to achieve memory boosting power might be about 200mg or about two cups of coffee. Anything more than that, for example 300mg could have a negative impact, such as undesired side effects like headaches and nausea. In other human studies, which looked at coffee the results have been inconclusive, but this previous research typically gave participants coffee or caffeine pills prior the test so it was sometimes difficult to separate impact on memory and effects on alertness, Dr. Yassa said on MedScape.com. “In our study, because caffeine was given after the initial viewing of the items, the effect is more likely to be due to memory rather than alertness,” he added. EdgePrep offers a complete SAT/ACT prep course, which prepares students for both exams. In this video, regular coffee drinker and Johns Hopkins researcher Dr. Michael Yassa describes how he conducted his research and why the results could be important to those needing to increase their memory power for tasks like preping for the SAT or ACT exam.